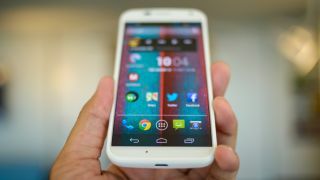 Motorola has confirmed the Moto X handset will finally make its way across the pond, with an official UK release date set for February 1. Ahead of Tuesday's media event, during which Motorola was widely expected to unveil the device for a UK audience, the Google-owned company said it will offer the device for £380 SIM free from multiple retailers. The 4.7-inch 720p handset, which packs Motorola's own 'X8 Mobile Computing System' and the stock version of Android, will also be available on contract, starting at £25 on the O2 network, while Phones 4U has dibs on the white device. Judging from Moto's media release it appears that the 'Moto Maker' customisation options which helped to make the handset an attractive proposition for stateside buyers won't be available in the UK. The Moto X, which will join its highly-rated cheap-as-chips sibling the Moto G on the UK market, does arrive in the UK packing the voice activated Google Now software. Motorola's camera software will also bring an innovative shooting mode which can be enabled simply by twisting the wrist twice and tapping anywhere on the screen and could also ensnare smartphone fans. The camera, in case you're wondering, is equipped with a 10 megapixel sensor and Motorola's 'Clear Pixel' technology, but before you get too excited, it was described as "the most inconsistent snapper on a flagship phone," in a TechRadar review last summer. All day battery life and a "water repellant" Gorilla Glass display are also some of the hefty promises made by Motorola, but at more than double the asking price is the Moto X really a better option than the Moto G? Let us know your thoughts in the comments section below.